Supreme Court has directed that any person who meets road accidents can be taken to nearby hospital immediately.Hospital must not ask for police report to admit him/her, its Dr. duty to do first aid. Police can be informed later. Every injured citizen brought for medical treatment should instantaneously be given medical aid to preserve life and thereafter the procedural criminal law should be allowed to operate in order to avoid negligent death. There is no legal impediment for a medical professional when he is called upon or requested to attend to an injured person needing his medical assistance immediately. The effort to save the person should be the top priority not only of the medical professional but even of the police or any other citizen who happens to be connected with that matter or who happens to notice such an incident or a “situation”. The escorters should, under no circumstances, be detained in the hospital for interrogation. On the other hand, he should be treated with courtesy. The driver or the owner of a vehicle involved in any accident that has caused injury or damage to any person is required to secure medical aid for the injured person,by taking him to the nearest doctor. 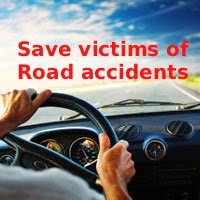 Also inform the insurance company about the occurrence of the accident,namely, insurance policy number and period of its validity; date, times and place of accident; particulars of the persons injured and / or killed in the accident and name of the driver and particulars of his driving licence.